Fits: All Celestron 11 inch (28 cm) f/10 SCT versions (metal or carbon fiber tube) with "Trifid" rotary cover Fastar secondary housing. Knobs: Black plastic, 16 mm (5/8 inch) diameter. 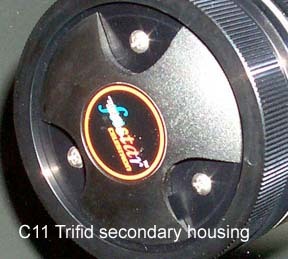 Note 2: Many Celestron 11 inch (28 cm) carbon fiber tube and metal tube SCTs manufactured from 2000 to 2005 have the Trifid rotary cover Fastar secondary housing. Do not use knobs for the Trifid Faster secondary on the flat secondary. The screws on these knobs are too long. Note 3: The rotary secondary cover must remain open when knobs are installed. The cover is cosmetic only and will not affect operation of the telescope.